There is very little processing here. I took the shot purposely over-exposed with the intention of working with the mid-tones when I processed it. But once I uploaded it, I really preferred the color version! I like the subtle hint of color from the leaves. 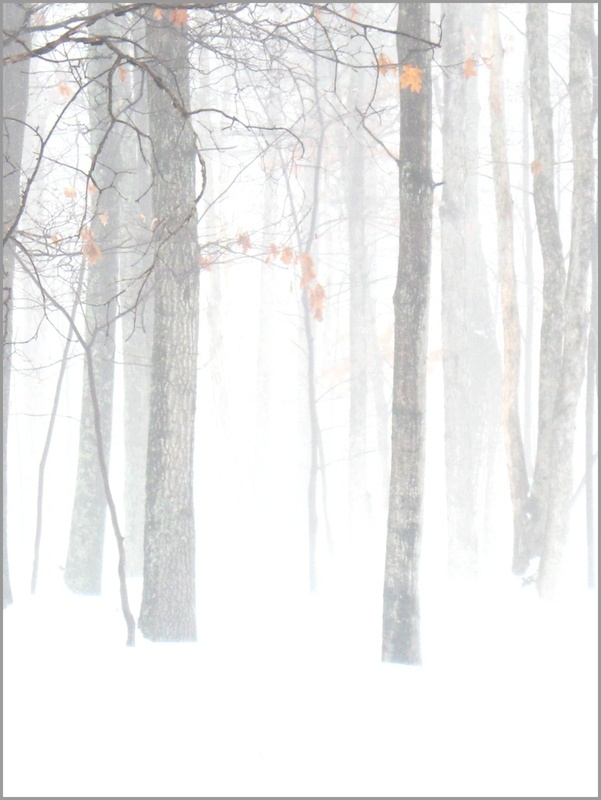 The fog worked in my favor as well; erasing most of the earth and snow beneath the trees. You can see the book club version in my main album. Wow. Very nice, Ann. Love the hint of color. Well done. the black and white version is outstanding, but i prefer this for the patches of reddish colours. I love this one with the hints of color. Both are very nicely done and I prefer this one. Well, I saw this one 2nd and I think I like it even better than the other! How about that....another fav! This is beautiful, too. I can see why you prefer this one. Both pics are great but I like this one best. Those bits of color I like! This one is pretty, but I like the BW version the best. My thanks to all! Wow- to have both versions hit the Trending page is pretty cool! I can't thank you all enough- you really are the best!!! Thank you so much for the favs ladies!! Ooh this is pretty too. I like the tiny splash of colour. @jesperani Thanks Jennifer- it's my preferred version although the other has remained on the PP for 2 days and I feel like I've won an Academy Award or something! I see the B&W version made the PP, but I like this one better, too. The tiny bit of color is very effective. Love this. That little pop of subdued colour is lovely. @eudora Thanks Diane! Yes, the b/w version made both the Trending Page and Popular Page, while this one got to the Trending Page. It's been a banner week for me with those three shots being recognized and now, thanks to wonderful folks like you fav'ing the Vintage Roses, that's on the PP now! I agree with you though, this is the better version of the foggy forest with that little pop of color.